A delicious fried chicken strips good as an appetizer or viand. This recipe resembles chicken tempura but instead of using Japanese bread crumbs or Panko bread crumbs, we used sesame seeds, cornstarch and flour. This coating will add crunchiness and texture to the fried chicken strips because of the sesame seeds. To cook sesame chicken strips; Place chicken breast strips in a mixing bowl, and add the rice wine vinegar, sesame oil, garlic and soy sauce. Marinate the chicken for a minimum of 2 hours in the refrigerator. Combine the sesame seeds, cornstarch and all-purpose flour, dip each marinated chicken strip in the sesame seed mixture to fully coat each chicken strip and set aside. Heat deep pan with cooking oil over medium high heat, heat up until the oil reaches 350 °F . And then drop the coated chicken strips one at a time and in batches. Continue to cook the chicken strips until it becomes golden brown. Place chicken breast strips in a mixing bowl, and add the rice wine vinegar, sesame oil, garlic and soy sauce. Toss the ingredients until the chicken is fully coated with the sauces. Marinate the chicken for a minimum of 2 hours in the refrigerator. 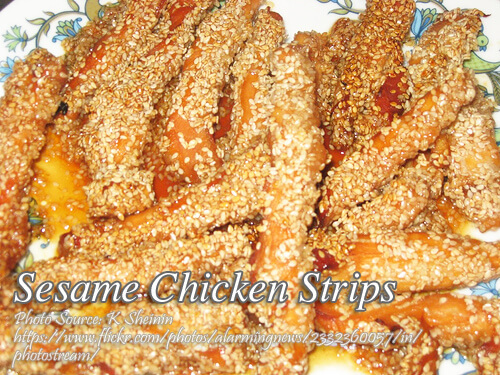 In a mixing bowl combine the sesame seeds, cornstarch and all-purpose flour, dip each marinated chicken strip in the sesame seed mixture to fully coat each chicken strip and set aside. Heat deep pan with cooking oil over medium high heat, heat up until the oil reaches 350 °F . And then drop the coated chicken strips one at a time and in batches. Do not overcrowd the pan to cook the strips evenly. Continue to cook the chicken strips until it becomes golden brown. Place over paper towels to drain excess oil. Then transfer the chicken strips to a serving plate. Serve hot. To make the sesame mayo dip; Place all the ingredients in a mixing bowl. and mix with wire whip until all ingredients are well incorporated, then transfer to a serving bowl.